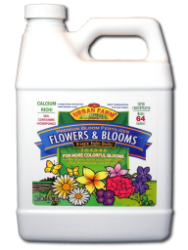 Flowers & Blooms Formula is a premium, greenhouse-grade nutrient for maximum size, aroma, and color in your flowers. Low in nitrogen, high in calcium, and loaded with phosphorus, this is the nutrient that will make your flowers burst with color. A two-purpose nutrient: excellent starter for germination and young seedlings, and a potent formula for all flowering plants. This low-nitrogen, high phosphorus formula will cause explosions of flowers, increasing the number of blossoms, and their ultimate size. Use for seedlings, transplants, and heavy flowering. Maximum color, size, and aroma. All Urban Farm Formulas are designed to produce stunning results in soil and potted plants, as well as hydroponics. Urban Farms has demonstrated that humic acid, bat guano, sea kelp, earthworm castings, and enzymes in the correct ratios and concentration add significantly to metabolic processes and the uptake of nutrients. Their formulas are the result of years of ongoing side-by-side trials and tissue analysis.